No expiration date or fees apply. This card may be applied towards any purchase at all Journeys, Journeys Kidz, Underground by Journeys, and Shi by Journeys locations in the United States or Canada. This card may be used for web and catalog purchases. For purchases outside of the US, including web and catalog purchases, exchange rates will be applied on the day of purchase. Value may be added to this card any time after the first purchase. Refunds will be applied to the card. This card may not be redeemed for cash, except to the extent required by law, or applied to credit card balances. This card will not be replaced if lost or stolen. No variance from these terms will be allowed except as expressly required by law. 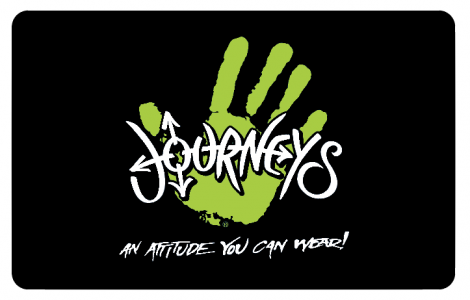 For a store nearest you visit Journeys.com. For balance inquiries call 1-888-386-5202. For customer service call 1-800-345-6983.